We are currently watching the latest round of Masterchef on BBC1. We haven't watched every episode but catch it from time to time. One thing which always amazes me about the people who take part is the way they cook dishes they have never tried or tastedI I mean this is a COMPETITION so if it was me I would make sure the dishes I cooked were tried and tested beyond belief! Heat olive oil, add onions and cook till golden brown. Add rice and stir in half the stock. Stir in remainder with cooked veg and stir until rice has absorbed liquid and veg is heated thoroughly. Add fish and cut egg. J is for Jam and pure Joy! I used vanilla yoghurt and the taste was simply out of this world! 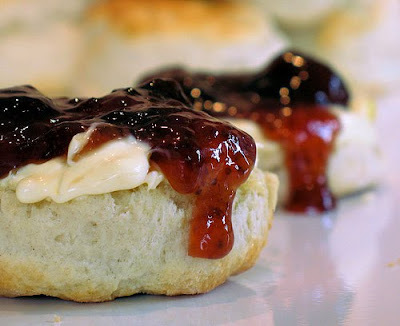 Add strawberry jam & cream! So easy but the taste, sheer sheer JOY! We as a family have been in the news! Last week I was featured on the Chris Evan's Breakfast show when I took part in the megaphone challenge, which takes place every morning around 8am! It was really funny and I had many people calling me up to say they had heard me. I regularly take part on a Hospital Radio Show and a couple of week's ago I shared all about ABC Wednesday which you can listen to here. I am on half way through the programme, 33 minutes 45 seconds into the broadcast. I talk about various recipes and ofcourse ABC gets a mention! Our Godson has his own radio programme on a local radio station, each Tuesday at 1pm. You can listen to it via this link! 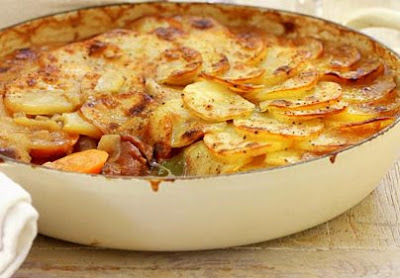 Continuing with my cooking challenge this week I am cooking a traditional lancashire hotpot! A new recipe for me. 1. Heat oven to 160C/fan 140C/gas 3. Heat some dripping or butter in a large shallow casserole dish, brown the lamb in batches, lift to a plate. 2. Fry the onions and carrots in the pan with a little more dripping until golden. Sprinkle over the flour, allow to cook for a couple of mins, shake over the Worcestershire sauce, pour in the stock, then bring to the boil. Stir in the meat and bay leaves, then turn off the heat. Arrange the sliced potatoes on top of the meat, then drizzle with a little more dripping. Cover, then place in the oven for about 1½ hrs until the potatoes are cooked. 3. Remove the lid, brush the potatoes with a little more dripping, then turn the oven up to brown the potatoes, or finish under the grill for 5-8 mins until brown. H is for Herby Potatoes. Life is very hectic at the moment what with my wedding commissions and Jon's business. Both entirely different but enjoyable in their own ways. I am developing a new product at the moment and received a fantastic response at a recent Wedding Fayre. Responses are all very well, but it is the follow up which is a true test of success, so to receive a deposit for a definite booking was a good measure of future commissions. With Jon's business it is all about bureaucracy and I am working on policy statements regarding Health & Safety, Quality Assurance etc. Sounds boring but it does bring back memories of the policy statements I was involved with in Education so I am finding it quite enjoyable in a strange way! Keen to keep up with my cookery challenge, ie to develop or try a new recipe each week today I am sharing my Herby Potato Recipe, a recipe of my very own, inspired by a jar of mustard! We were with one of Jon's customer's last week and for lunch I had warm potatoes together with a lovely fillet steak kebab. The customer runs a farm shop and had a variety of interesting jars on sale, amongst them I saw a jar of Horseradish Wholegrain Mustard. On our return home I cooked some roughly cut potatoes and stirred in a couple of tablespoons of the mustard together with 2 beaten eggs. I then transferred the mixture to a greased oven dish and cooked for 15 minutes. Absolutely awesome! We have to return to the shop in the not too distant future so I will be developing the recipe when I try out different mustard and other bits and bobs! G is for Good Old Fashioned British Cooking! Easy Chicken & Mushroom Pie! so I decided to do a good old fashioned pie, chicken and mushroom to be precise, why? cos we had chicken and mushrooms in the fridge. This is my recipe, I made it up for ease, and to be part of my cookery challenge! Cook chicken in a splash of oil. Add stock cubes/stock and cook until chicken well coated. Dissolve flour in a jug with a splash of cold water, gradually add in stock from pan. Add pastry lid and trim edges. Coat with beaten egg & cook 20 - 25 minutes in 180 oven. We will be having this tonight, will let you know how it goes, but the tasting I did throughout was very favourable, let's see what the boss? thinks! lol! I came across this fun project and decided to join in! I buy all of Jon's ties, so it was fitting to start the ball rolling with this, my favourite tie. Due to my business I attend many wedding fayres, and indeed it was at one event I saw this tie and had to buy it for Jon! Whenever I attend any function I always try to find a little something for Jon and he was over the moon with this. I love the detail in the tie, especially the road sign! It is appropriate today as our own motorbike is having it's annual MOT test so it will be ready to take us out and about on our adventures! Thanks to Troy for having the brainwave! Synchronicity means everything happens at the right time, right place and often for the right reason. Contact someone you've been thinking about. When you think of someone it is likely they are thinking about you. Learn to read the signs and go where you are guided.